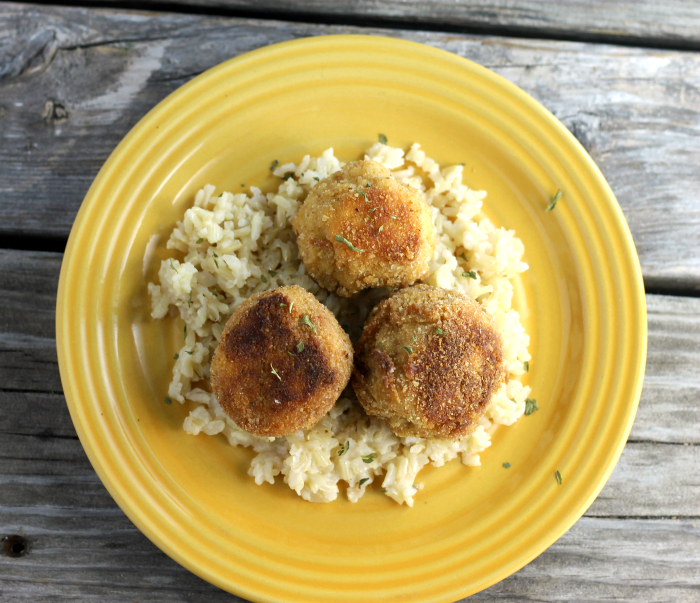 These chicken Kiev meatballs are simple to make and make a delicious weekend dinner. I am happy to say that the cold snap has moved on out. Not saying that it isn’t cold, but none of the below zero stuff looking ahead for the next week or so. I have to say that just a few degrees warmer makes a world of difference. Every once in a while, I come up with a good idea or sometimes even a great idea. Such is the case with these chicken Kiev meatballs.Mike loves chicken kiev and I love just about anything with chicken. But, let’s face stuffing chicken breast is not always the easiest of thing to do. When the idea of chicken Kiev meatballs popped into my head I knew that I would have to try them. The concept is the same, butter and herbs to fill the center of the chicken meatballs then rolled in bread crumbs for a crispy outer layer, but so much easier. When I try making a chicken breast that has a filling in them it seems that I usually pound the chicken breast too much so they are too thin or I do not pound enough and they are too thick and hard to roll up. With the meatballs, you don’t have to worry about that. Adding the butter was a synch too. First I softened the butter and added the herbs and garlic, then rolled in plastic wrap and set in the fridge to harden up. Once it was hard, I removed it from the plastic wrap and cut it into pieces and wrapped my ground chicken around it. 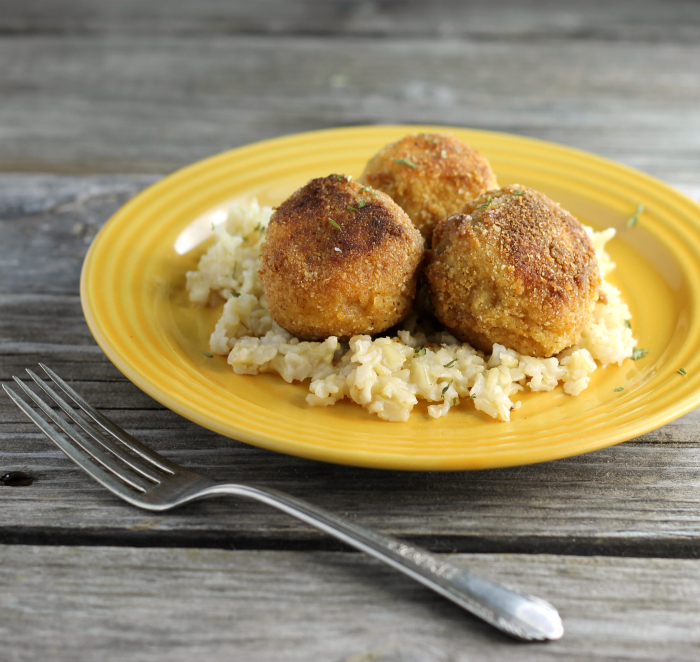 I baked these chicken Kiev meatballs, hoping to make them somewhat healthier. They turned out perfect. Take the softened butter and mix in the minced garlic and parsley. Once you have it all mixed together, place the butter on some plastic wrap. Roll the butter up in the plastic wrap and form a "log" that is about 8 to 10-inches long. Place in the refrigerator until it is hard. Take the ground chicken and mix in the salt and pepper. Divide the chicken into 20 equal amounts. Once the butter is hard, remove it from the refrigerator and cut into 20 pieces. Take one of the ground chicken that you have divided and wrap the ground chicken around the butter, continue until you have 20 meatballs. Once the meatballs are completed set up your breading station. Add the flour, eggs with water, and bread crumbs into individual bowls. First you will roll your meatballs in the flour, then the egg and water mixture, then into the bread crumbs, and then you will repeat the eggs and bread crumbs. Line a baking pan (I used a jelly roll pan) with aluminum foil. Spray with a non-stick spray. Set the chicken Kiev meatballs on the prepared pan. Set in the refrigerator for about a half and hour. Remove from the refrigerator and drizzle with olive oil. Preheat oven to 375. Once the oven is preheated place the meatballs in the oven. Bake for 30 minutes. After 15 minutes of the baking time remove the meatballs from the oven and turn over. Drizzle the meatballs again with olive oil and place back into the oven and bake the last 15 minutes. When rolling the chicken Kiev meatballs in the eggs and bread crumbs, divide them into batches. 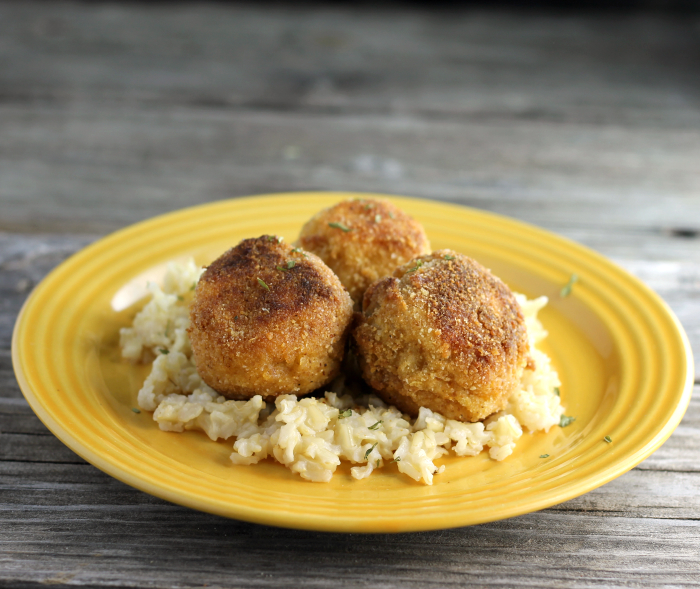 Start out with 2 eggs with 2 tablespoons water and 1 cup of bread crumbs, roll the first 10 meatballs. After the first 10 are completed. Add the other 2 eggs with 2 tablespoons water and the other cup of bread crumbs. Iove these chicken meatballs ! I grew up in Russia, so I love Chicken Kiev, which is an authentic Russian/Ukrainian dish! Making it into a meatball shape is such a unique twist on an old classic! Looks so delicious! I love this baked version of chicken meatballs. They look scrumptious, Dawn. Meatballs are on a lot of menus this week. This is a really creative twist — the butter no doubt enhances the dryness of some ground chicken. Great idea! These baked meatballs look fabulously YUMMY and full of delish flavours. What an innovative way to serve Chicken Kiev. Definitely trying this! 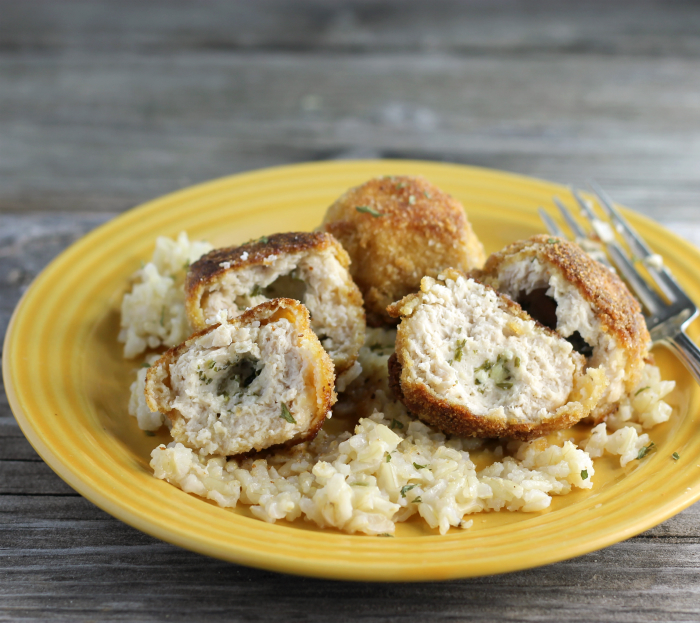 I used to make Chicken Kiev way back when—I kind of forgot about it. But your meatballs sound just as delicious! !